The participation readings are an event series of DIE BUCHPATEN. We visit children in kindergartens, primary schools and everywhere children gather in everyday life. The participation readings are held in the technique of the dialogic reading including all children actively into the reading. After the reading, the children draw what they liked best about the story. While the children are drawing, DIE BUCHPATEN exchange views with the parents about storytelling. At the end, each child is gifted a new and current picture book to keep the storytelling culture at home alive. Every picture book is accompanied by a BUCHPATEN-bookmark with useful tips for maximum storytelling-fun. For an insight on what such a participation reading could look like: Take a peak at our Blog. 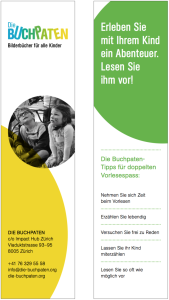 It is important to DIE BUCHPATEN that the children’s progress be as sustainable as possible. For that reason we wish to accompany the children over an extend period of time, and we advise you book three readings or more, spread out over the whole year. DIE BUCHPATEN are happy to hear from you! DIE BUCHPATEN are constantly in search of involved and enthusiastic storytellers. Are you ready for a new and rewarding challenge? Do you want to capture the attention of children, give them joy, and help them learn? Then look no further!